SINGAPORE – The U.S. 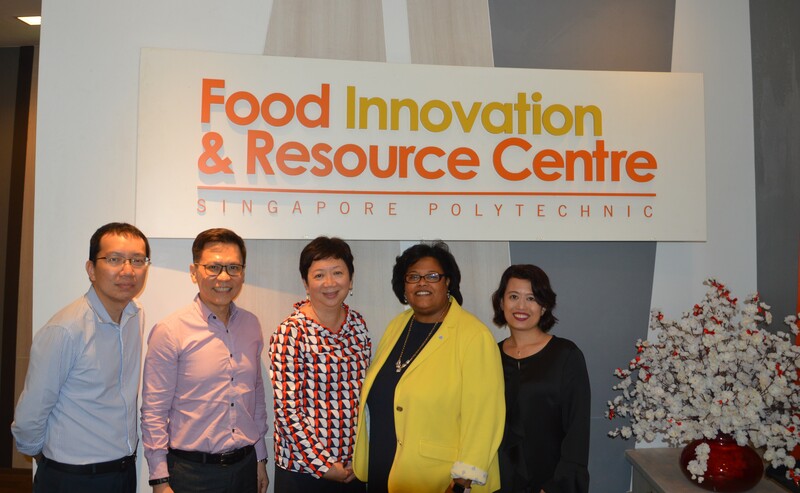 Dairy Export Council (USDEC) and the Food Innovation and Resource Center (FIRC) at Singapore Polytechnic signed a partnership agreement in May that furthers U.S. dairy’s commitment to food innovation to meet the needs of Southeast Asian customers and consumers. The Memorandum of Understanding (MOU) lays out a framework under which USDEC and U.S. dairy suppliers will work together with FIRC staff to deepen dairy knowledge, develop innovative U.S. dairy-containing food products for the Southeast Asian market, and support U.S. dairy customers while providing consumers in the region with more dairy-based options suited to their specific tastes. A partnership agreement between USDEC and the Food Innovation and Resource Center (FIRC) at Singapore Polytechnic was celebrated by (from left) Zen Tan, FIRC business development manager; Martin Teo, USDEC technical director, food applications; Loong Mann Na, FIRC center director; Vikki Nicholson-West, USDEC business unit director, Southeast Asia; and Dali Ghazalay, USDEC regional director, Southeast Asia. FIRC, a joint venture between Singapore Polytechnic and Enterprise Singapore, a statutory board under the Ministry of Trade and Industry the Singapore government, was formed in 2007 to provide food companies with technical expertise in new product and process development. It is part of the government’s vision to position Singapore as a leading food and nutrition hub in Asia. What is the Innovation and Resource Center (FIRC) at Singapore Polytechnic? The new global partnership in Singapore is the second announced for U.S. dairy in consecutive months. An innovation partnership also was signed in April between USDEC and China’s Jiangnan University, creating research and educational opportunities at one of China's most respected food science centers. Both global partnerships are made possible by USDEC’s domestic partnerships with state and regional dairy checkoff organizations as well as USDEC’s parent organization, Dairy Management, Inc. USDEC appreciates this generous support from our farmer-funders through the dairy checkoff program. For more details on the partnership, read our news release. Vikki Nicholson-West is business unit director, Southeast Asia, at the U.S. Dairy Export Council.